Working in a bookstore, I am often asked “I just finished GRR Martin’s Game of Thrones books.. what do I read now?” I have two go-to answers: Brent Weeks and Mark Lawrence. But I might just have a new author to add to the pile, and that is Luke Scull. 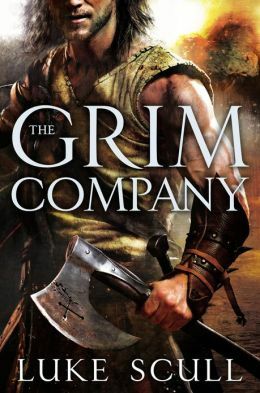 The cover of The Grim Company caught my eye first, so I picked it up and opened it at random. I don’t remember what scene I read, but two pages was enough to convice me I needed to read the book. Centuries ago, the mages fought the gods- and won. The 13 old ones were vanquished and the mages (in typical victor form) promptly began to wage war on one another. By the time of The Grim Company, the land is divided among powerful and antagonistic magelords. Dorminia is ruled by a particularly despotic wizard named Salazar. Currently the greatest threat to his kingdom is the White Lady who rules Thelassa. The Grim Company is notable for having several narrators on all sides of the conflict. Cole is a young member of a rebal band (the Shard) in Dorminica. He imagines himself a hero thanks to his magic blade- if only he didn’t keep losing said blade thanks to his lack of fighting prowess. Cole also dreams of winning over his fellow rebel Sasha, but she proves a smart warrior in her own right. Brodar Kayne is a battle-hardened Highlander. Along with his compatriot Jerek aka The Wolf, he fights to overthrow Salazar and ends up adventuring with Cole. There are ship battles, mine explosions and sword-fights aplently. Eremul is a wizard who survived Salazar’s culling of magic-users at the price of his legs. He has played both sides for so long that, given the chance to strike a decisive blow, he is no longer sure where his loyalties lie. Barandas is the chief of Salazar’s Augmentors, an elite guard given magic weapons and protection. Yllandris is a female mage who serves one of the highland warlords but dreams of becoming his queen. The Grim Company first drew me in with its snarky writing. Then the characters kept me turning the pages. None of them are perfect, but all of them are somehow relatable. Even Barandas (solidly in the camp of bad guys) is a man who loves his wife and wants to serve his country. Of course, battles and adventures abound. Scull takes a turn into horror with zombies, tentacled killers, and horrible dragons. There is mining magic from the corpses of the gods. There are old scores settled among highlanders. Feasts, looting and treachery abound. In short, this is a good fanatasy book and a solid beginning. I liked the depth of the characters, and how none of them were as good as they saw themselves- or as bad as others saw them. I liked the strong female characters (in every role from rebel to sorceress to queen.) I liked the fast paced action. I could’ve used a little more clarification on some of the backstory, but you don’t develop an entire mythos in one book. In short, thank goodness this book is being sold as the first of a trilogy because I want to read more! I feel like this author could be the next Brent Weeks or Mark Lawrence- the next heir to the line of GRR Martin- and I really hope he doesn’t disappoint. You might like: (do I really need to say it at this point?!) GRR Martin. Brent Weeks. Mark Lawrence. This entry was posted in Fiction and tagged book review, dragons, fantasy, fiction, swords. Bookmark the permalink.